Developer Techland took a risk with their last Call of Juarez title, and it didn’t work out. The Cartel abandoned the Wild West setting of previous games, instead offering a ridiculous modern storyline that didn’t resonate with gamers. 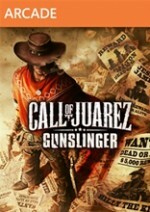 With the downloadable title Call of Juarez: Gunslinger, the series is back to its western roots and far better for it. Gunslinger’s story mode is told almost exclusively via flashbacks, putting you in the role of bounty hunter Silas Greaves. As he regales curious bar patrons with tales about his wild past, you play through them. You’re left guessing about whether or not the protagonist is telling the truth, with plenty of gameplay segments being altered as you play them. You might be shooting at Native Americans one moment, only to see them morph into outlaws as Greaves gets his facts straight. This is a cool twist on the standard FPS format, but it sometimes feels like it’s putting the brakes on the action. As Greaves recalls details of the events you’re playing, the game often goes into slow motion as he narrates. The story chapters are linear affairs, and task players with taking down Wild West legends such as Billy the Kid, Butch Cassidy, Jesse James, and more. You’re rarely given the chance to go off the beaten path, as the developers seem more concerned with tossing you into firefight after firefight rather than letting you explore. Thanks to the fast-paced and responsive gunplay, I didn’t mind the linearity. Fans of western films will see many common locales here, including dusty saloons, trains, and steamboats. You won’t be getting an in-depth plot (it’s no Red Dead Redemption), but Gunslinger makes no attempts to be a serious take on the genre. It’s all about pistol-slinging action, and it does it well. Two meters fill as you shoot your way through the West. One allows you to enter a bullet-time mode that makes enemy locations more apparent, and another allows you to perform a Matrix-like dodge when a lethal shot is headed your way. Both of these do a good job of mixing up the standard gameplay, and they saved my life dozens of times. Silas earns XP as he takes down enemies, and he can spend skill points on various abilities and stat upgrades. Some of these have a big impact on the gameplay, such as the ability to mash the reload button to load bullets into your revolver quicker. Greaves’ story wraps up in five or six hours, but Gunslinger’s arcade mode is a perfect way to hop back in for some quick shootouts. This mode takes out the narrative breaks from story mode, allowing you to focus squarely on making short work of dozens of enemies. You’re scored based on your performance, with combos boosting your score if you take foes down in quick succession. Killing enemies with headshots, explosives, and other skilled shots give you bonuses, and arcade mode features a leaderboard that lets you compare your score with friends. I wanted a reason to continue the action after completing Gunslinger’s story, and arcade mode is a good way to shoot up some baddies without any story breaks. I was surprised by how much I enjoyed Gunslinger’s shootouts. The game certainly doesn’t turn any FPS conventions on their ears, but it still presents tense and entertaining shootouts frequently. Blasting through the game’s varied environments with a pistol in each hand never got old, and I always looked forward to the end-level duel with a legend of the Wild West. After the dreadful Call of Juarez: The Cartel, I was skeptical going into this downloadable offering. To my surprise, Techland has bounced back with a very enjoyable tribute to the tall tales of the Wild West. With this downloadable offering, the series is back to its western roots and far better for it.